Come join us to create your own little slice of Italy. Grande Cheese is opening their doors and giving an exclusive opportunity to bake in their state of the art kitchen. 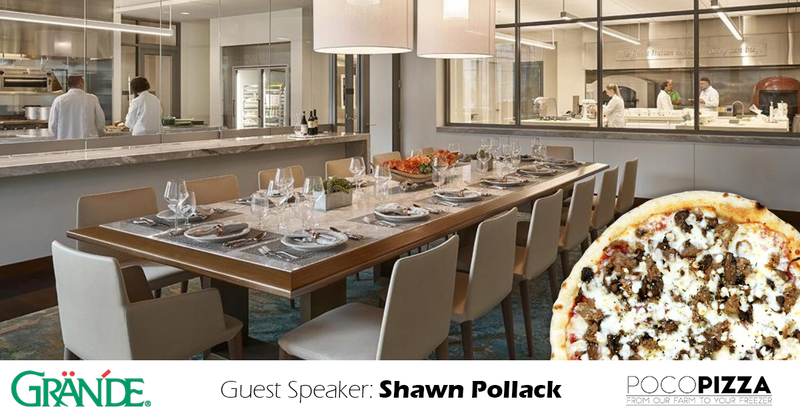 Shawn Pollack, entrepreneur and owner of Poco Pizza, will guide you on a journey of the importance of fresh ingredients and “poco preparation”. Shawn traveled across Italy and discovered how to help people reconnect with wholesome, delicious, flavorful foods. Shawn is also proudly a 100% Grande Cheese customer. In a blind tasting test when determining which cheese to select for his unique, one of a kind pizzas, Grande Cheese won hands down every blind taste test. This makes a lot of sense when you learn that Grande’s heritage began over a century ago in the small village of Montelepre, Italy and they have continued the tradition of making fine Italian cheeses ever since. Come learn about combining fresh ingredients to achieve optimal flavors that complement each other, make your own “poco pizza” and enjoy refreshments while networking through Grande’s beautiful facilities. Register Now!Doors open at 5:30 PM with welcome and introductions at 5:45 PM. Make your own pizza will begin at 6:00 PM and will carry on through 7:30 PM. Be sure not to miss the fireside chat with Guest Speaker, Shawn Pollack at 7:00 PM. Participants will get to make one Poco Pizza and beer, wine, and soda are included with the event. Ample opportunities for networking along with a self-guided tour route of Grande Cheese’s lower level. Purchasing tickets in advance is highly recommended. Registration closes Friday, April 19. Being part of YPF is a terrific way to build a quality peer network and to really engage in our community.